If the capacity of capital assets used is almost the same every period, the best amortization method is straight-line amortization. However, if the usage of the capital asset varies significantly from one period to the next, the best method to use is the Units of Production amortization method. As an example, a real estate builder may use construction equipment one month, and thereafter not use it for many months. ** Notice the total # of units is 40,000 which equals to the total useful life of the machine. 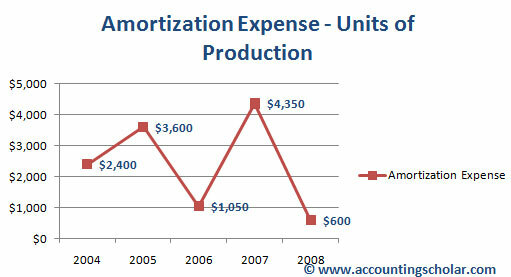 This above graph shows the amortization expense incurred in each year using the units of production amortization method. Notice how the amortization expense fluctuates each year thanks to the # of units actually produced (output) for that year. For instance, the total # of units (output) in 2004 was 8000 units while that number increased to 12,000 in 2005. This means amortization expense in 2004 ($2,400) was lower than the amortization expense in 2005 ($3,600). This above graph shows the decline in net book value of the capital asset using the units of production amortization method. This graph shows a steady decline in the net book value of the capital asset, which is a normal sign. 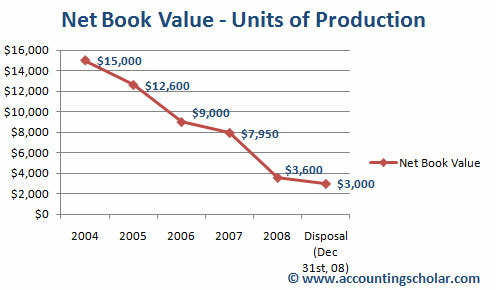 Notice that on December 31st, 2008, we reach the disposal value of $3,000 after which the asset is expected to be sold or disposed off, thus the net book value calculation stops here.